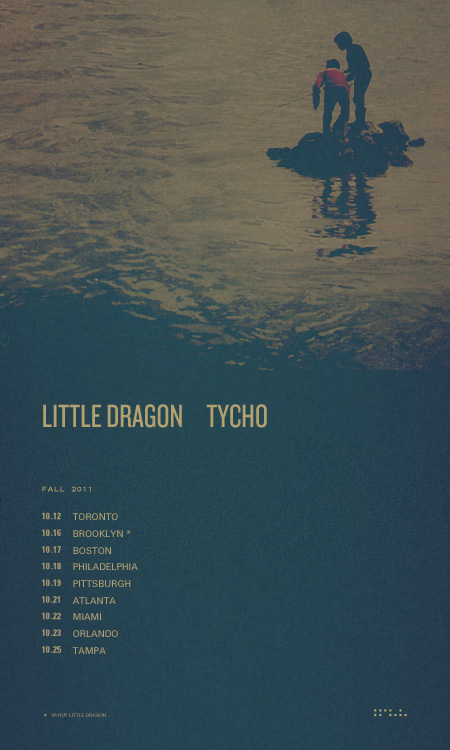 Yet another Little Dragon-related post, but with more of a focus on Scott Hansen, also known as Tycho or graphic artist ISO50. His latest record recently came out on Ghostly International, and it certainly sounds music created by someone who knows how to craft a visually-evocative landscape. The music flows through a watery landscape that really, really does synthesize well with the album cover featured at right. One more live date tomorrow on December 10th, in San Francisco at The Independent — and then nothing until January 13th in Chicago, at Lincoln Hall. See below for his bio. 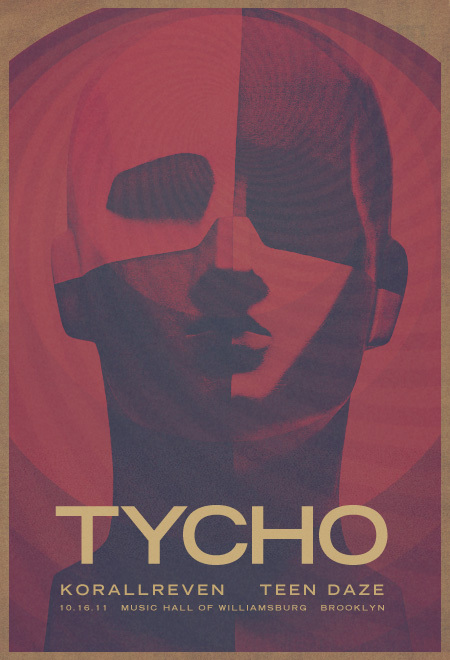 For sound nerds, Tycho gives Wired a tour of his fancy equipment and elaborate set-up. 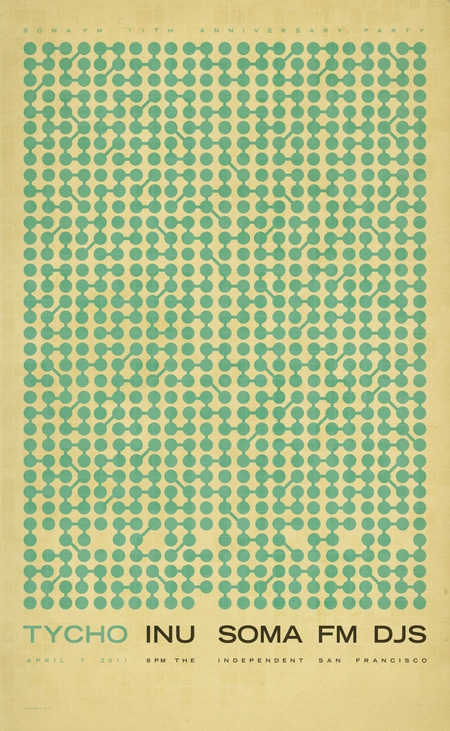 Here are also some posters from recent shows and releases and such. They all live in the same desaturated world of beauty. You can almost smell the smooth matte paper stock. Mmmm. The product of a prolonged break from IS050’s design work and blog, Dive pays tribute to Tycho’s prismatic past, but spends most of its time pointing to the project’s not-so-distant future. That can mean any number of things, really, from the halcyon hooks and hopeful horizons of “A Walk” to the expansive, wildly expressive tone poetry of the title track, an eight-minute epic that unfolds like a compressed concept album. Or at the very least, a restless vision of prog-rock—one that’s been coated in neon colors and filtered through a thick piece of blotter paper. And then there’s “Elegy,” a spare curtain closer that pairs a vulnerable crescendo with a fitting bridge to future works. And with that, Dive establishes its position as the most diverse musical statement of Hansen’s multi-medium career; the point where his skills as a performer finally catch up with his vaporized vision of a world that doesn’t belong to any particular time or place. 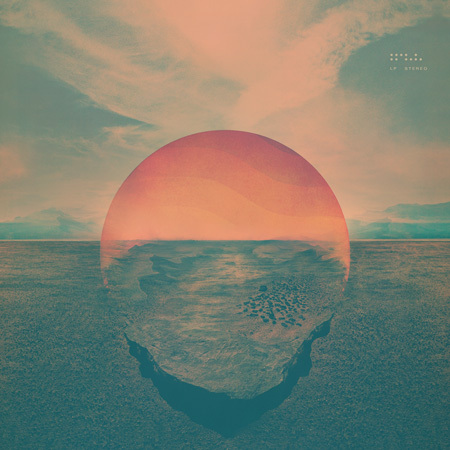 Additionally, he’s upped the ante with the Tycho live show as well, playing a handful of upcoming live dates as a 3 piece (and sometimes 4), but keeping the head-turning visuals intact.